Foreign policy is normally deeply rooted in the domestic policy of a country. It has to mesh with internal policies since many international policies are linked to domestic concerns. The problem arises when foreign policy becomes embroiled in domestic politics, especially on operational matters. It used to be said that there was a broad political consensus on India’s relations with Pakistan, and each successive government in New Delhi followed a similar policy towards Islamabad. That political consensus has frayed in recent years and the government’s policies towards with Pakistan and China have become contentious domestic political issues. Political parties do not hesitate to use foreign policy issues to fulminate against the government. Cricketer turned politician, Navjot Singh Sidhu’s trip to Islamabad to attend the swearing-in ceremony of Pakistan’s new Prime Minister Imran Khan has drawn criticism from political opponents and irate television commentators. Some of the critics have dubbed any contact with Pakistan to be an anti-national activity. Sidhu, a minister in the Congress government in Punjab, had been invited to Pakistan by Imran Khan who had known him since his own cricketing days. Sidhu attended the inauguration of the new government in Islamabad, seated prominently in the front row beside President of Pakistan occupied Kashmir (PoK), Masood Khan. Much to the chagrin of the critics, the former cricketer was seen enthusiastically hugging the Pakistani Army Chief, Gen Qamar Jawed Bawja. Sidhu was roundly criticized by the ruling BJP, the Aam Admi Party and Akali Dal spokespersons while an advocate filed a case of sedition in a Patna court against Sidhu. His own party leader, Punjab Chief Minister Capt Amarinder Singh also expressed disquiet at Sidhu giving the Army Chief an exuberant embrace at a time when Indian soldiers were being killed at the Line of Control. On his return from Pakistan, Sidhu explained that his trip had been cleared by the central government, and he did not recognize the Pok leader sitting beside him. He said that he had talked peace with Gen Bajwa, and the Pakistan Army Chief had said that the Pakistani government was making efforts to open the Kartarpur corridor for the 550th birth anniversary celebrations of Guru Nanak Dev. The Gurdwara Dera Sahib Kartarpur, the last resting place of the Guru is just three kilometers from the border, where people gather on the Indian side to catch a glimpse of the shrine. An earlier proposal from the Pakistani side to open a pilgrims’ corridor to Kartarpur for visa-free movement by Indian pilgrims did not get implemented. Sikh groups have been pressing the central government to take up the issue of opening the direct Kartarpur route with the Pakistani government for the Gurpurab celebrations in 2019. On hearing this proposal, the excitable commentator-politician hugged the General twice. In the flurry of charges and counter-charges, a significant element in the Sidhu saga is being missed; that is the actions of Gen Bajwa. 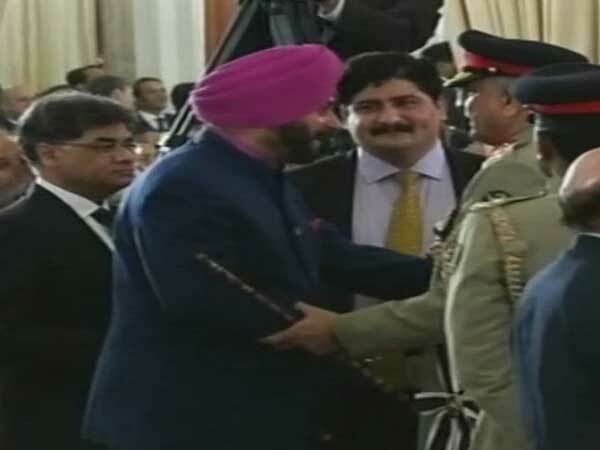 The Pakistani Army Chief, not only greeted Sidhu in a public gathering place under the gaze of a horde of television cameras, he responded to the embrace by an Indian politician and proposed to fulfill a deeply emotional demand of the Sikh community in India. The proposal is a carefully planned gesture from the Army Chief and is in line with the newly elected Prime Minister Imran Khan’s offer of taking two steps forward to one step forward by India on the path of peace. It is the first such positive signal from the Pakistani military leadership. Pakistan has had a decade of civilian rule, but it still the armed forces that has the main say on security and foreign policy in Pakistan. The Pakistani army is said to have thwarted the efforts of the civilian governments to improve ties with India. Former Prime Minister Atal Bihari Vajpayee made repeated efforts to reach out to Pakistan despite all the set-backs, whether it was the Kargil betrayal just after the Lahore bus yatra, the attack on Parliament or the failure of the Agra Summit. In the sharply polarized political landscape in India, any issue can become contentious. Congressmen have questioned Prime Minister Narendra Modi’s stopover in Lahore when he attended wedding festivities at former Pakistani Prime Minister Nawaz Sharif’s ancestral home. The official dialogue between India and Pakistan is stalled since the terrorist strikes in December 2015; India’s refusal to attend the Saarc Summit in Islamabad has also disrupted the Saarc process. The absence of bilateral dialogue between the two neighbours creates an unstable environment, where even humanitarian issues remain unaddressed. Prime Minister Narendra Modi referred to constructive engagement during his phone conversation to congratulate Imran Khan. A new prime minister in Pakistan, who has a comfortable relationship with the Army can make the effort to bring down the tensions in the bilateral ties.